What goes around comes around. 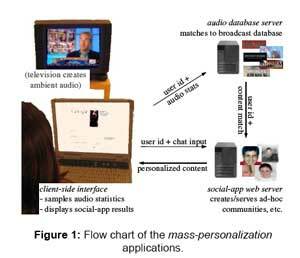 Google picks up where many have failed in synchronising TV and web 2.0 – “Google developing social and interactive television applications for ‘mass personalization” is the ZDNET header. About six years ago, just at the dawning of interactive TV in the UK a few companies were trotting their cross-media wares to the BBC (one of my roles to welcome them) – in the category ‘webTV, cross-platform synchronicity’. There were several solutions to allow TV or Radio to trigger other platforms, especially websites across devices. The basic scenario was that any BBC channel could push out triggers (audio is of particular interest for this post) and your web enabled device could respond appropriately. So a news programme on TV or radio would automatically set the page on your browser to the same story, or a documentary would provide you with alternate pics or segments on your PDA or, my favourite, a drama on TV would set-off parallel audio or video bytes on your laptop. The companies that were involved in this included webchoice, dremedia, editTV, autonomy and a few others. I have not googled around to link to them as some probably don’t exist anymore. But the reason for this post is to point out that some technologies only make sense when the audience are ready for it. At the time the broadcast production back-ends were just not set-up to send simultaneous triggers out to multiple platforms from a central server (most still aren’t) – but what we saw allowed much of this simul activity to take place at the user end. Webchoice is the company of interest for this post. I worked with them in 2000 to set up a range of working demos that basically had BBC programmes controlling the pages on your web browser, using audio ‘bleeps’ embedded into the audio of the TV programme. For the demo they were audible (to show the trigger point) but in the final version they were super or sub sonic. It was fascinating sitting and watching TV while every couple of minutes your browser would go to any number of relevant pages – providing in the demo, more depth and backstory. So six years on we have Google working with the Center for Neural Computation, Hebrew University of Jerusalem, and winning Best Paper at the Euro ITV conference for literally the same technology. The big difference here though is audience experience and application. With rich personalization metadata the experience each user gets, even in the same room naturally, can be unique and personalized. Also ad hoc forums and groups can be set-up by connecting those that have similar interests and who suddenly are a dynamically created group – a part of a magazine programme about Taiwanese Architecture comes on and you have the option of talking with hundreds of like minds around the world as your interest in the topic is already on the system. What didn’t exist in 2000 was endless chat forums about any and every niche subject, or the ability to have real-time video conferencing on your PC while you watched a TV programme. The current simul usage of devices often occur around TV watching (although that is shifting to be PC centric) and this is a simple solution to synchronising and personalising the experience – if you opt in of course. A supersonic tone that hotlinks all your devices. The device recognises the tone and jumps to what is appropriate on that platform. It could take you to the forum discussion immediately at the end of a programme, a place to submit your vote, or tick you through a multi-choice synchronised quiz. It could even trigger links inside a virtual world or google earth to give you geographical insight and locative overviews – great for ARG applications. Now if only a big company put money into making the proprietary format virtually a standard through force majeure – oh yes Google are behind it 😉 Here is a link to the ‘quite’ academic paper for your pleasure. One thing that also springs to mind with this simple technology is for the audio triggers on the TV to send mobile phones off-portal to specific sites (given the difficulty in typing in URLs into mobile devices). I wonder if WebChoice who were way ahead of the curve have IP or patent in this? I have seen several papers between then and now with much the same idea but with the might of Google and the fact they are currently advertising for a iTV head over in Mountain View – I suspect we may be hearing strange beeping noises coming out of our TV’s very soon. How about one to close the curtains in our smart home or start the microwave popcorn when the big film starts. But of course that is already something you can see in many a ‘home of the future’ demo in the foyers of most of the key tech companies around the world already.